November 18 – With the US national team floundering at the bottom of their final World Cup qualifying group and looking increasingly uncomfortable with the ball at their feet with every game, they could do worse than send their players to one of the TOCA Soccer centres for some intensive ball work. TOCA Soccer is the brainchild of former Fulham, LA Galaxy and US national team player Eddie Lewis. It is a programme based on intensive individual learning of ball skills in a three or four person environment. It is an individual training philosophy that is catching on. Lewis currently has TOCA Soccer centres in Torrance (part of the LA Galaxy training centre) and in Costa Mesa in Orange County, California. In a year’s time there could be as many as 50 centres licensed across the US, such is the speed that they are catching attention from the US football community. “We are not a club. We are driven by the player and their needs. The training we are offering isn’t like anything we have seen before. We are primarly individual and small group training with three or four players at a time in each studio,” said Lewis. The Costa Mesa centre is the blueprint for a TOCA Soccer centre. Indoor and sectioned into ‘studios’ by nets (roughly 15m x 10m in size), the training is focused around a ball machine, designed by Lewis, that controls speed, angle of delivery of the ball and interval. The machine, driven via a smartphone app, can also be operated on a random programme. The value of the system is the number of touches that a player can receive in a session, allowing the payer and the coach to repetitively work on learning and improving technique as well as ironing out flaws that would never be addressed in a team training session. “We evaluate players based on a standard test of their technical ability and then build this into eight week programmes with specific session from turning, outside of foot, jnside and so on. A lot of time is spent on the weak foot. It is an organised professional approach following a clear but flexible curriculum,” said Lewis. Every exercise is recorded and put on to the player’s profile which the trainer can access via the app. In a typical session a player will touch the ball 500-600 times. Lewis developed the ball machine out of a personal desire to work intensively on his own technique. He tested the machine on teammate Claudio Reyna who loved it and from that point Lewis knew he was on to something. He is now at the point where the TOCA Soccer model concept can be industrialised. In the first quarter of next year will be rolling out internationally with the UK as the first market with clubs and a potential FA validation. 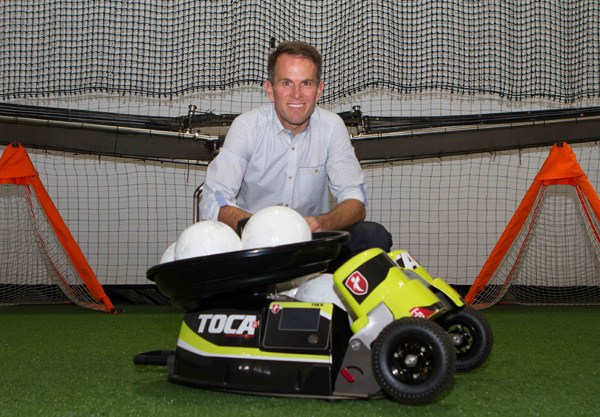 The economics of a TOCA Soccer license are based around getting individuals and small groups of players into the centres to fill up the studio space. Sessions cost roughly $70 per player per hour, but Lewis says they are priced according to the economics of the local area. So far he hasn’t had difficult attracting players desperate to find that training edge. At the Costa Mesa centre, after less than a year of operation, they have over 3,000 registered users. The US men’s game still has a lot of catch-up to do on the pitch, as illustrated by their losses against Mexico and Costa Rica in the international break. That progress will only come with better players. TOCA Centres could easily become an ingredient in the training mix that generates a supply line of new players with the tools to compete at the top level. And with the intensity of the TOCA Soccer training, the US may not need to wait too long to develop a much deeper pool of world beaters.